Many farmers familiar with poplar trees grown for the pulp and paper industry are uneasy about growing poplar in support of a new bio-based fuel and chemical industry. Even though AHB researchers demonstrated how poplar can be successfully grown on short three-year coppice rotations, farmers want to know more about how difficult and expensive it will be to prepare farmland for another crop after the final poplar harvest. To demonstrate this process, AHB researchers are working to restore the project’s demonstration poplar farms to their prior conditions. Researchers found that because coppiced poplar stumps remain relatively small, they can be broken up and incorporated into the soil rather than having to be removed from the field. Grinding up the poplar biomass remaining in the field limits resprouting of poplar remnants, allowing quick preparation of the land for another agricultural crop. This is a big contrast to poplars that are grown for pulp and paper markets that leave large stumps in the field. In Jefferson, Oregon, poplar trees grown for the AHB project were harvested and the field was restored and planted in winter wheat. Many farmers share stories about poplar plantations from the past. In the 1990s, farmers across the Pacific Northwest planted poplar for the pulp and paper industry only to find the market had vanished by the time the trees were ready to harvest. Farmers often reminisce about how wind and ice wreaked havoc on poplar plantations, making the removal of large poplar trees and stumps even more difficult and expensive. It is not surprising that potential growers want to understand the process for removing poplar trees grown on coppice rotations for biofuels and biochemicals. 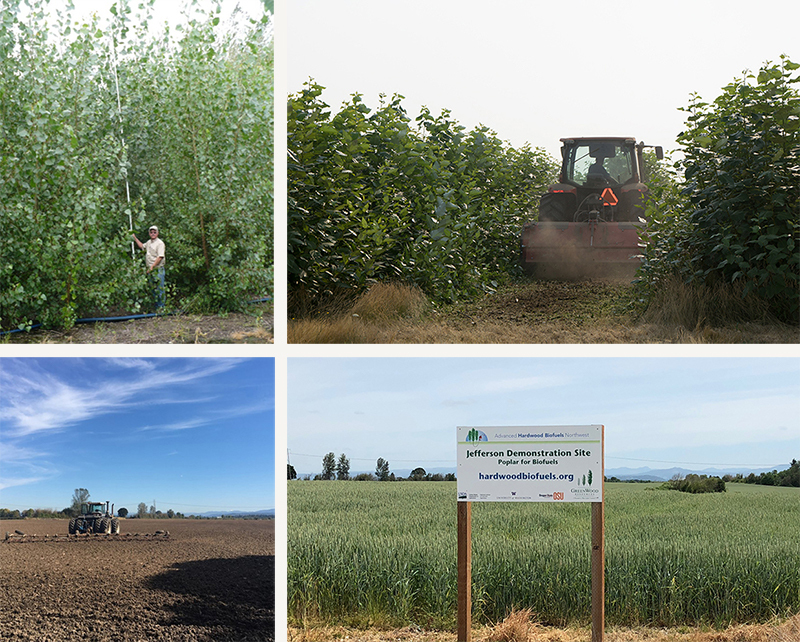 At AHB’s demonstration sites in Jefferson, Oregon and Hayden, Idaho, GreenWood Resources began restoration activities in 2017 after harvesting the poplar bioenergy farms for the final time. Plantation managers took a similar approach at both sites, mulching the remaining stumps, roots, and other debris left in the field, which speeds up decomposition. 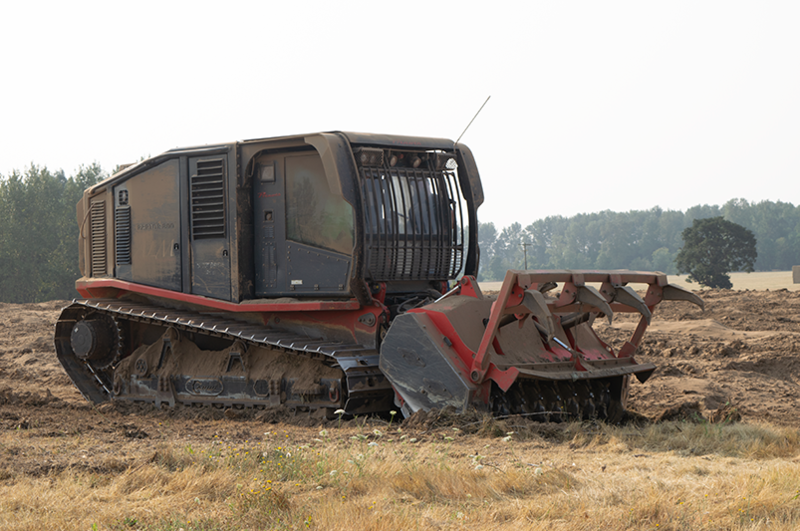 Greenwood used two mulching implements, the Prinoth RF-800 and Fecon Soil Hog, to incorporate the woody biomass into the soil. Multiple passes reaching depths of up to nine inches successfully pulverized and integrated the biomass. Then traditional agricultural equipment, such as finish discs and harrows, were used to level the field in preparation for the next crops. At both sites, arid summer and early fall conditions combined with thorough pulverization of the biomass resulted in successful restoration without needing any herbicides to prevent the poplar from resprouting. Land managers have since replanted both sites, planting winter wheat in Jefferson and alfalfa in Hayden. A Pinroth RF-800 created lots of dust as it worked to restore the poplar demonstration site in Hayden, Idaho. Work had to be stopped several times to prevent dust from impacting nearby residential neighborhoods that were downwind of the operation. If a poplar-based biofuel industry and strong poplar market develops, the hope is that after the 20-year lifespan of a poplar bioenergy farm, poplar production would continue on the site. In this scenario, rather than being restored to another use, the site would be prepared and replanted with new poplar trees. The land manager could simply shift crop rows to the former alleyways and use surface mulching to break up any debris remaining above the soil surface. This process would be less intensive and less expensive than the steps required to restore the site for a different crop. Rich Shuren and Rick Stonex from GreenWood Resources shared their experiences restoring AHB’s demonstration sites during AHB’s webinar on March 22, 2018. The webinar is available online at http://hardwoodbiofuels.org/restoration-from-poplar-plantings-to-conventional-ag/.